Enrichment Fair and Kids Day! Last Tuesday we went to Enrichment night at school (yes, I drugged everyone up, we just couldn't miss this!). The Enrichment fair is basically a time where the kids and the teachers, can show off what they have been doing all year. We were so excited to go because Teralyn was in a play and she was also doing a transportation presentation and a power point presentation. We just couldn't miss it. Well, the Motrin worked wonders for Tera. The play was so cute. 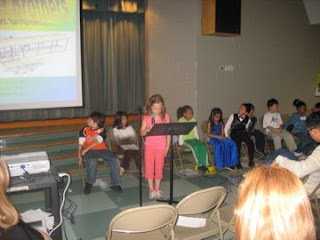 Tera was the April page in the play and had about two or three lines, but did them very well. Well, Shay was barely making it, so after the play we quickly went to see Shaylee's classroom and all her art, and Ashtyn, Shay, and I decided we should go quarantine ourselves again. Bri got a video of Teralyn's transportation presentation and said she did an awesome job in front of a whole room full of people. She said she wasn't a tinge nervous. It's amazing how far she has come!! Man, just a couple years ago, there is no way she would have done that. I was so sad to miss out, but at least I have a video. Memorial day was our Kids Day. This was our tradition in my family growing up, on Memorial and we LOVED it, so we do the same for our kids. We woke up early and went to the store to pick out favorite cereal (this is one of their favorite parts, because they usually don't get sugar cereal so they pick the most unhealthy cereal they can find and I just close my eyes...). Then, we headed on over to the park to have a picnic breakfast (we used to do it in the canyon, but since we don't have a lot of those out here, the park is our best bet). The girls played on the jungle gym for a while and then we headed home to get ready for our trip. 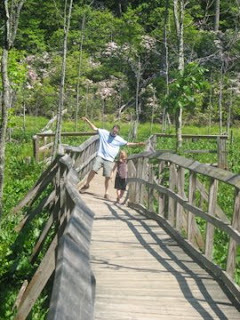 We decided this year to go to a place called Calvert Cliffs. It's a beach on the Chesapeake Bay that has some awesome scenery. You park your car at the Calvert Park and the have some great picnic places and a tire park, and then you hike on into the beach. The walk is about two miles. So, it was beautiful and a perfect day. The walk was really long though for kids and I was surprised there wasn't more complaining than there was. When we finally got to the beach, it was beautiful, but really crowded and we only found one tiny little shark tooth (supposedly Calvert Cliffs are known for good shark teeth hunting and shell hunting). 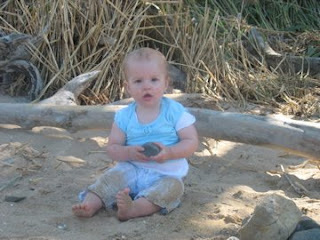 Raegan crawled in the sand and loved it, but hated when she tried to stick it in her mouth. Ashtyn got in the water up to her waist in her clothes. 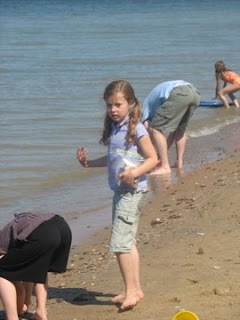 Shaylee had a great time though and found some shells and clay that she insisted on keeping. Well, we were only there for probably forty five minutes and decided to go back. Overall, I'm not sure if the drive to it (about an hour and a half) was worth the beach. I have to say the walk/hike was the best part about it. The scenery was great and the rivers etc. 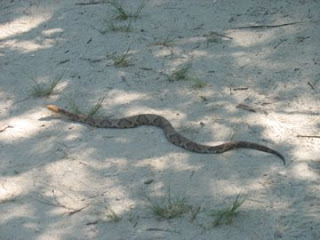 We even saw a huge snake in the path! When it rains it pours. At least when it comes to sicknesses in our family lately. It all started about two weeks ago when Raegan got Roseola. Just a day or so after she recovered Ashtyn came down with a fever. At first I thought maybe Roseola, but it seemed a little different, her fever wasn't as high. Well, her fever broke and then she started complaining of a sore throat. So we checked and yes, she had blisters covering her mouth and her tonsils. Pour girl! I knew right away it was Hand Foot and Mouth disease. So, we sent her to bed and I started thinking and wondering about this weird rash that had just appeared on my leg. I had been having hip and leg pain for a couple of days (just on my left side) and now I had this rash. Could it be Hand Foot and Mouth? Well, I looked it up and realized that it was probably Shingles!! Could I actually have Shingles at my age? I didn't even consider it until then because I thought I was too young. I quickly called my mom and she suggested to call the doctor that night and see if I could get in for the Viral shot that is supposed to stop your shingles from spreading. The problem is, it doesn't work unless you get it in the first 48 hours. I counted the hours in my head, and it had been almost 48. The doctor wanted me to wait until morning, so I got in as early as I could and sure enough, Shingles...and I was too late for the medication. My doctor wouldn't even consider giving it to me though because I'm a nursing mother. You just have to wait it out, was all she said... Hmm.... Well, I went home a little frustrated and a little worried (since I had heard of long term effects from shingles) and couldn't keep back the tears. Bri gave me a great blessing that night and my spirits were so much better the next day. Although my leg hurts and still does, I feel like I am going to get through it just fine. 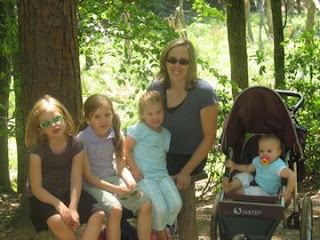 The next few days I had my older two girls catch the dreaded Hand Foot and Mouth disease. So, we took a doctor trip just to make sure because Shay's tonsils were closing up (they were SO swollen). 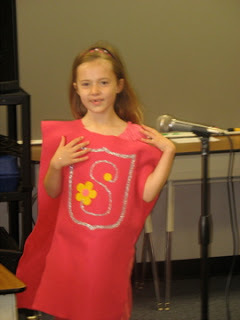 Then I had a wierd UTI infection that popped up (could that be what caused the Shingles... hmm...), and just when I thought Tera was all better, I sent her to school and had to go pick her up early for a weird rash that had appeared all over arms!! What is going on? Raegan turned one on Sunday. We made her a small cake, set it on a plate in the middle of a sheet and let her go at it. 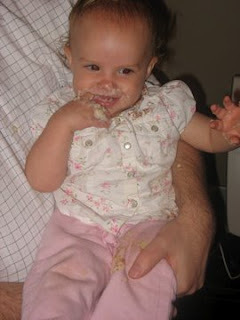 Out of all our kids, she is the first one to actually get in and get messy with it. We were quite impressed. As you can tell with the video, she quite enjoyed it herself. 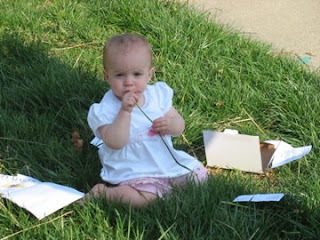 We had a fun birthday party for Raegy with just our family. The girls gave her a little swimming pool and Bri and I gave her a dump truck that she can sit on and push herself around. She loved it, or at least the box. It seems so unreal that it has actually been a year since we have had our little Raegan. We are so glad she has joined our family. When she eats something she likes, she says, "mmmm.... " through the whole thing. She loves loves loves string cheese and will jump on her knees for it. She gives awesome hugs, especially in the morning and after nap. She can say "Hi!" and will to just about anyone. She waves bye bye at bed time. 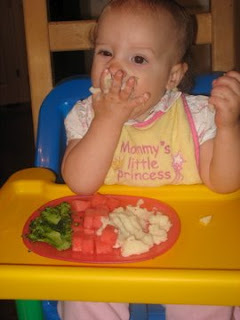 Favorite foods are mashed potatoes, string cheese, strawberries, and crackers. Picky eater unless she is really really in a good mood. Loves loves loves to play with her sisters. 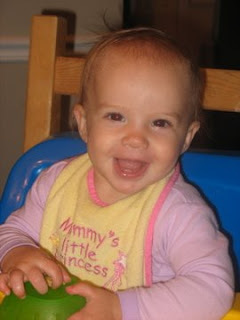 Says, "mamma, dadda, bye, hi, doggie, uh oh (when something falls), and num num (when she's thirsty). Knee walks with the best of 'em. Favorite thing to do is climb on Ashtyn's bed and jump up and down. Favorite place is on the arm of the couch hanging on to the railing and yes, tackles all the pillows to get there. Loves outside and will do just about anything to get there. Every time we laugh, she does too. Starts to blow while she's waiting for her food to be ready. Dances to music and tries to sing along. We sure love ya Raeg! (There is a video in this blank space above, just click on the play button in the lower left). This past week has been a sick week for my little babe. After five days of really high fever, I finally took her in to the doc. and insisted that we have a catheter done to see if she had a UTI (we have a history of UTI's in our girls). Well, it was no fun for anyone and resulted in Raegan screaming and me trying to comfort her and then of course, her peeing all over me!! I guess that's what I get for insisting on a catheter. Right when we got home she broke out in a huge rash and it ended up being Roseola. 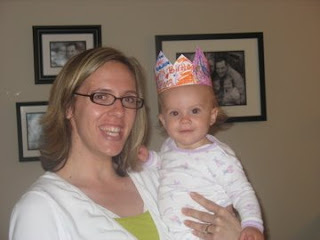 The day before Mother's day, Brian and my girls gave me just about the best gift I could have asked for. They cleaned the house! Yes, they cleaned the bathrooms, the basement, the kitchen, vacuumed, and even mopped the floor (my least favorite job). I was quite impressed. Brian mentioned that he knew I wouldn't have a good mother's day if I know my house is a mess... hmmm... I guess he is starting to catch on. So, Mother's Day morning Brian didn't have early church meetings so he took the girls and got them all ready for church before I woke up!!! I have never been much of a morning person, so it's really hard for me to get up early and get all the girls out to church by myself on time every Sunday. It was so so so nice to have a break from this. The girls and Bri brought me breakfast in bed (Sweedish pancakes with powder sugar...mmmm!!) and then I quickly got in the shower and we headed to church. Raegan got a fever while we were in church and so Brian had quite a fun time trying to calm down a tired, sick babe. I had a nice and relaxing time though and even got a huge sugar cookie from Shaylee (thanks Sandi, it's was great! ), three mother's day cards, and chocolates. We came home, put our sick baby to sleep and spent a couple of hours playing Monopoly Jr. with our girls. Bri was planning on giving me a nap, but since I had such a good night sleep, I spent the rest of the afternoon reading. We then had a little party where my girls gave me shake maker (yes, they picked it out and used their own money), and Bri gave me the Anne of Green Gables DVD's. I am so excited!! I have been wanting them for years! I have some great memories of watching them with my sisters and mom and can't wait for my girls to watch them with me. Bri made my favorite home made rolls, Chicken mushroom bake, baked potatoes, Julia's green salad, and yummy chocolate cake from Costco.... yummy! It was awesome and we were so stuffed. We chatted for a while, the girls went to bed, Julia went home, and Brian did the dishes. All except my sweet baby's fever, it was one of my favorite mother's day ever! She gets so excited over the smallest things. she gave birth to and raised six kids! All six of her kids have gone through the temple. She can sew with the best of 'em and even made my wedding dress! She magnifies her callings and is a great leader. She had awesome cook books that she has made. She is very thrifty and is awesome with her budget! For the last three days Raegan has slept through the night. Yes, that is what I said. For the first time in her life, she has slept a full eleven hours without waking up to eat. I consider this her biggest and greatest milestone. Finally, finally, just before her year birthday (on the 18th) I am not waking up to nurse her in the night. I am so excited about this. This is the milestone that all mothers wait for. The day that they will finally be getting sleep again. My sweet husband has tried and tried to get me to not feed her in the night, but when you are so so tired, and you know that if you just nurse her, she will go back to sleep, then it's so much easier. So after months and months of this nursing session, it starts to weigh on you and drag you down and that is when you just have to say, "I've had enough". So, the other night I told myself I was going to do it. I got my earplugs ready, shut my door and slept (well, kind of). I was so worried about her all night that I didn't really sleep, but when she cried in the night, Brian went right in, put a binkie in, and left. She cried for all of two minutes and didn't make another peep until 7:30! Who would have thought that it would be that easy? Granted, we have tried this before (a few months ago) and it didn't work, but I had no idea that it would have EVER worked. I was preparing myself for some major battles. Okay so, Brian and I have struggled on how to teach our kids the value of money and chores. When we first got married, I was all about our kids having chores and earning an allowance each week. Bri argued that this way isn't teaching them that being part of a family is helping each other, and that there should just be things that they do every day just because they are in our family. I have to say, he has changed my mind. So, over the past seven or so years, we have tried to teach our kids to help out by doing the dishes and cleaning their rooms etc. with no monetary rewards. So, now that our kids are a little older, they really don't understand the value of money. In the past when they needed something, we would get it for them. When they wanted something, they would have to put it on their wish list for Christmas or their birthday. It has worked out just fine, but now they are old enough that they should be working for and saving their money so our plans need to change. I think I have talked about our bean jars before. We fill these jars up with beans depending on if they get their things done during the day without a lot of asking or complaining. They have to clean their rooms, make their beds, get dressed and ready for the day, help with dishes, do piano, etc. They then get a handful of beans. So far this has worked great. The kids are so motivated because when their jar is full, they get a mommy daughter date or a daddy daughter date. Now our plan is that when it is all the way full, they also get ten dollars. They have to give some to tithing and some to savings, and the rest they get to spend or save for something they want. They also have to use their own money from now on for presents for their sisters on birthdays and Christmas.. Anyway, Ashtyn was the first to get to the top so we went on a mommy daughter date on Thursday evening. She was so excited and it was so fun to spend some alone time with her. First we went to Wendy's and got ourselves a picnic. We took a blanket and went to Lake Elkhorn and ate our picnic. Then we played on the jungle gym and I even went down the slide with her (I don't think those things are made for six foot tall adults). We walked around the lake for a little bit and watched the ducks and then headed on over to McDonald's to get an ice cream. We sat on a hill overlooking the lake and ate it and laughed and laughed at our faces with chocolate all over them. We both had a blast and we both can't wait until next time. When I got home the girls went to bed, I fed Raegan and then headed on over to my book club. We had a good time discussing our book, The Book Thief, and stayed until about 11:00. My throat started hurting really bad and I noticed it was swelling a little. I took a couple of ibuprofen and went to sleep. About 3:00 in the morning I woke up with my throat killing me and very swollen. I looked in the mirror and my uvula was huge! I was getting a little nervous since I felt it was starting to block my breathing. I woke up Brian and talked to him a bit and we decided to wait until morning. At 6:00, I woke up and could barely talk, my throat was so swollen. I was beginning to panic and had to tilt my head forward to breath clearly. Bri called my doctor and she said to go into the ER. We got the girls ready for school, sent them over to our neighbors, and headed on to the ER. I got in quickly, but of course it took forever in the ER. They gave me a steroid shot in my arm to stop the swelling and then took a strep culture. At one point my blood pressure dropped really low and I was beginning to pass out. They took my blood sugar and it was 70, so they have me orange juice and crackers. I was much better after that. Four hours later, my swelling was going down and my strep throat culture was positive. I was so relieved to go home, with just a strep infection because in my mind I thought it was an allergy of some sort. Bri stayed home all day and helped me out and I went through a while of fever and tiredness, but after a few doses of antibiotics, I am feeling much better. So now that you have heard my whole crazy day of mommy daughter dates, book groups, and an ER visit, I am curious about how you veteran moms and dads out there, and even the not so veteran handle the chore, money situation. Do you give them allowance or are they just expected to help?